Reivew: 'Out Of Blue' Is A Whodunit About Stars And Star Power This introspective (and occasionally downright lethargic) existential whodunit starring Patricia Clarkson and a cast of ringers is based on the Martin Amis novel Night Train. 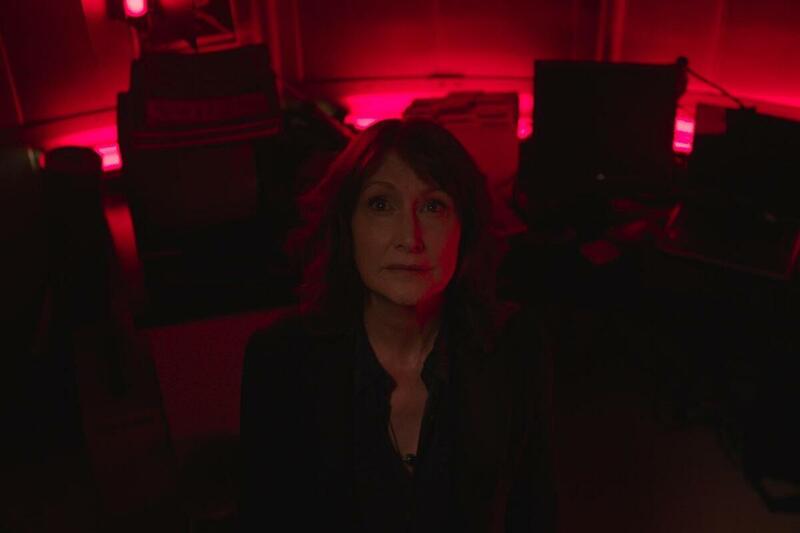 Patricia Clarkson stars in Out Of Blue, a genre-bending detective flick. The movie is based on the Marin Amis novel Night Train. How do you feel when you're watching a detective story and the murder is definitively solved at the halfway point? Cheated ... or intrigued? That's a good litmus test for how you'll respond to Out of Blue, a lush, unhurried new mystery thriller from writer-director Carol Morley. Loosely based on the Martin Amis novel Night Train, the film is an existential whodunit that's less concerned with big revelations than it is with deeper thoughts about quantum theory and stardust. It's bold and occasionally maddening, but there's not much other genre fare like it right now. Patricia Clarkson is all snarls as Detective Mike Hoolihan, a recovering alcoholic investigating the murder of an astrophysicist in New Orleans. Hoolihan is known as an expert closer, but she's stymied by this case: the victim (Mamie Gummer) comes from a prominent family, she was killed in an open-roof observatory so the rain would wash away all DNA traces, and her death bears striking similarities to the work of a long-dormant serial killer. Every lead seems to turn up not only a dead end, but also an intense period of self-reflection, owing to the toxic combination of Hoolihan's own repressed memories and the sheer number of suspects and witnesses who want to chat about black holes and Schrödinger's Cat. As you'd expect from a perp walk like this, the margins are filled with stellar character actors. Toby Jones puts his mousy anxiety to good use as a university colleague of the victim, while the duo of James Caan and Jacki Weaver gnaw off the edges of the screen as her grieving parents. You could have made a whole movie about their family, which is steeped in those fascinating details of Southern gentility masking dark secrets, right down to Caan's bum leg and seersucker suit. These folks' interactions with Hoolihan are defined by their oddness: not odd in the way you might expect potential suspects to act, but in a way that indicates these people (and this film) are interested in very different things. An academic boyfriend (Jonathan Majors) discusses the "ideas" of parallel universes he's been working on, and when he's informed of his partner's death, his response is, "Why?" A friendly news reporter (Yolonda Ross) becomes a kind of confidant who's never particularly interested in finishing her story. Carl Sagan fans will take issue with the laughably generic way Out of Blue dispenses celestial wisdom. Yet the film's mix of extraterrestrial stardust and New Orleans mysticism turns out to be a potent one, at least visually. Brightly colored stars in the night sky shine above antiques-stuffed shotgun houses on Earth. But Morley is never terribly concerned with moving the story along, as Clarkson's deliberate blank slate of an investigator takes her time with long silences and memory-blitzing flashbacks. For years, modern fiction has waged a battle over whether a world-weary protagonist (particularly a female one) needs an elaborate tearjerking backstory. Out of Blue splits the difference by dribbling out Hoolihan's biography in a way that feels ... immaterial. She's affected by her trauma, but she could just as well be affected by the tragic reality of living as a human on Planet Earth. Even when she ID's the true culprit, the two just wind up having a heart-to-heart. Out of Blue could have used even more bizarre touches, as its pacing occasionally dips from the contemplative into the outright lethargic. But Clarkson is compelling even when she seems barely conscious, and her one-on-ones with the various denizens of this ambiguous world have a slinky quality that allows this film to breathe on its own. It turns out that there's no need for an expert closer when you're hurtling down the vastness of space.